The restaurant business is one of the most profitable and respectful business practiced all over the globe. Restaurant owners and hotelier moreover generally forms the creamy layer of rich fraternity of a society. But every business has to follow statutory, regulatory and administrative guidelines. These guidelines are, in most of the cases set by the Government. Any sort of filtration or breach of such regulations can lead to penalization. Hence,often such activities make the convict to pay huge fines and penalties. Restaurant Business is not any exception. Many authoritative guidelines hence govern these businesses. One of such regulating guideline is cleanliness. The respective departmental administrative authorities frequently conduct inspections and check up on restaurant cleanliness. In cases of unkempt or not properly maintained restaurants, huge fine and penalties are imposed. Apart from the maintenance of general cleanliness, special emphasis must be given to the cleanliness of tiles and grout. Restaurant business is a business of glamour. Hence,each and every corner of it must shine with show and sophisticated elegance. A restaurant of normal level generally has three sections – the kitchen, the eating or dining section and the facility or utility section. Out of these three, the kitchen is the most sensitive part as the first round of inspection starts from here. Cooking is done in kitchen. Restaurant Cooking involves various procedures which very frequently cause oil and spice spills over the floor. Moreover,these spills are very stubborn and tough in nature. Restaurant kitchen has fitment of numerous cooking and food processing equipment. They are needed to be maintained regularly. Moreover,often grease and lubricants are used. Many a times these grease and lubricants smears the tiled floor. During the business hours there is a huge rush of waiters in the kitchen usually. Frequent visits of people messes the tiled floors. Hence,it leads to dust and debris accumulation from the footwear of waiters and stewards. Deposition of oil stains, grease, spices and dust over the tiled floors gives them a nasty look. They can attract rodent, flies, vermin and pests.Moreover, this can contaminate the food stock of the restaurant and result in unhygienic food preparation.Additionally, this can give unwanted odor and affect the taste of the food with health issues for the customers. Overall, a great legal issue seeking huge fines and penalties can come to the forefront. In the utility and facility section of a restaurant, washroom is one of the most frequently used areas during the business hours. Staff and customers use the washrooms many a times in day. Washroom floors get dirty with the dust and particles from the footwear of the occupants. Unwanted activities like vomiting or any other health-related incidents also affect the cleanliness of washroom tiles. They can be source of contamination and physical ailments. Under the scanner of administrative authorities, such poorly maintained washroom can fetch penalty situations for the owner. 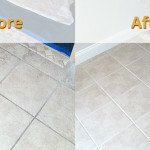 How to maintain Restaurant tile and grout? Grout Sealing or Resealing methods used by these professionals can make your grout less sensitive to dust and debris. Grout Sealing forms a layer over the grout which makes it water and stain resistant. Kitchen grout stains removal process which can enable you to restore your kitchen floor. It imparts the new like look to your kitchen floors. Tile and grout sanitization process can remove all sorts of molds and mildews from the tile and grout. This keeps the tile and grout away from pest or microorganism infestations and prevents health concerns. Hence, to prevent fines in your restaurant business and to maintain cleanliness, professional tile cleaning is essential. Professionals have the right knowledge and skills to give your tiles and grout a new like look. Moreover, they have the right expertise and know how to take care of tiles depending upon the material. 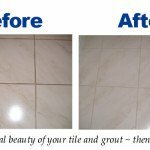 Fresh Tile Cleaning is the best source of tile and grout cleaning in Melbourne. We have a hard working staff which not only cleans your tiles but also sanitize and polish them. 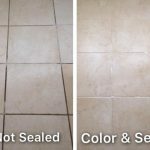 Moreover, you will be able to form a good impression and attract more customers when your tiles and grout are neat and glossy. It will help you earn more revenue for your business. All you need to do is give us a call and our expert will reach you in no time. We have flexibility in terms of scheduling an appointment. Hence, you can avail our services anytime, even on weekends or public holidays. We are certified company and use latest equipment and technology to restore your tiles. Give us a call now for availing best offers and discounts.